I offer a 20-minute consultation at no charge. If you want to discuss whether acupuncture is right for you, are hesitant about needles, or want to meet me first, this is your best option. At your first appointment, we will spend about 30-45 minutes collaborating about your healthcare needs. We will share your current condition, health history., medications, and other concerns.We will discuss information to help me understand your condition from a Chinese medicine perspective. I may do direct physical examination by feeling painful areas or looking at injury sites. Finally an examination of your pulses and tongue will complete the intake process and lead to a diagnosis and treatment plan. 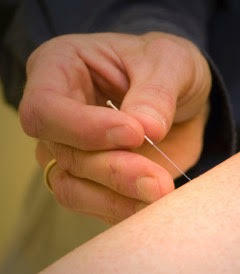 Treatments generally involve the use of 10 to 30 needles, depending on the condition, and last 20 to 30 minutes. 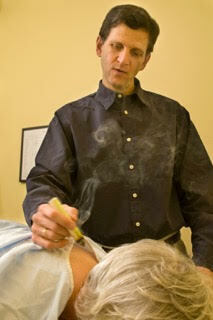 A heat treatment called moxabustion may be employed while the needles are in or after their removal. During the treatment you may fall asleep or just lie still in a quiet state. Note- It is not absolutely necessary to use needles for treatment. I have a laser and an electrical stimulation device which can be used for children and adults alike. Both are very effective. Healing is a very individual process. Many conditions like acute low-back spasms respond on the first treatment and may resolve after 3-4 treatments. Other acute conditions like colds and flu may require 1 or 2 treatments. Many chronic conditions heal at a slow, progressive rate over 10-12 treatments. I have however seen severe chronic illness resolve after 4 or 5 treatments. Healing is often an erratic process with periods of feeling better mixed with periods of seemingly no change or feeling worse. Acupuncture is not magic. Allowing 5-10 treatments to see if your condition will respond is a reasonable approach. At each visit you will report any changes you experienced from the last treatment. I will modify the treatment plan accordingly and the needling will proceed as on the first visit. Based on your changes I will suggest how far apart to space your treatments. This time usually increases as you begin to heal. Our goal in the healing process is to get you well to the point where you then return 3-4 times a year for seasonal tune-ups that serve as health maintenance. I suggest the use of Chinese herbs to supplement the acupuncture treatments for some patients. For acute external invasions and for replenishing severely depleted energy they help support the system on a level that enhances healing. My family and I have used these homeopathic remedies and Chinese herbal formula for several years now. We all feel that we have fewer cold and flu episodes and that if we do get either, it is shorter and less severe. There are two homeopathic remedies and one Chinese herb in the kit. The remedies provide a non-toxic, energetic message to the body about flu and cold viruses. This message increases the ability of the immune system to react to these pathogens and repel them. Chinese herbs strengthen the body’s energetic function helping it fight off pathogenic invasion. The kit provides enough pills to treat a family of 4 for one year, depending on frequency of illness.